Tags are used to mark a specific version. Usually a tag will not be moved anymore. The image below shows the commit log of Git Extensions with a tag indicating version [3.00.00]. 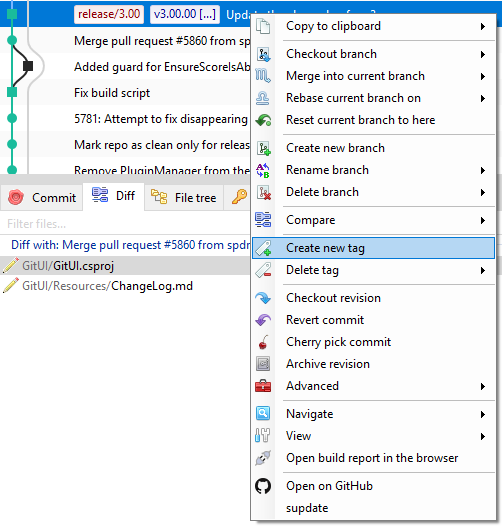 In Git Extensions you can tag a revision by choosing Create new tag in the commit log context menu. A dialog will prompt for the name of the tag. You can also choose Create tag from the Commands menu, which will show a dialog to choose the revision and enter the tag name. Once a tag is created, it cannot be moved again. You need to delete the tag and create it again to move it.